CAUTION: HOW TO KEEP YOUR BANK ACCOUNT from being stolen by hackers. • The new clash of the isms — explaining capitalism, socialism and communism, and the crux of the 2020 elections. • Profit from Mideast disasters. If the Saudi dictatorship really does have all that oil, why are they searching for more outside the country? • Strengthen your self defense. Here are easy ways to keep your marksmanship at its peak, and know when you can and can't legally pull the trigger. • More good news about the internet crisis. It won't be as bad as you think. The recession of 1946 show why. 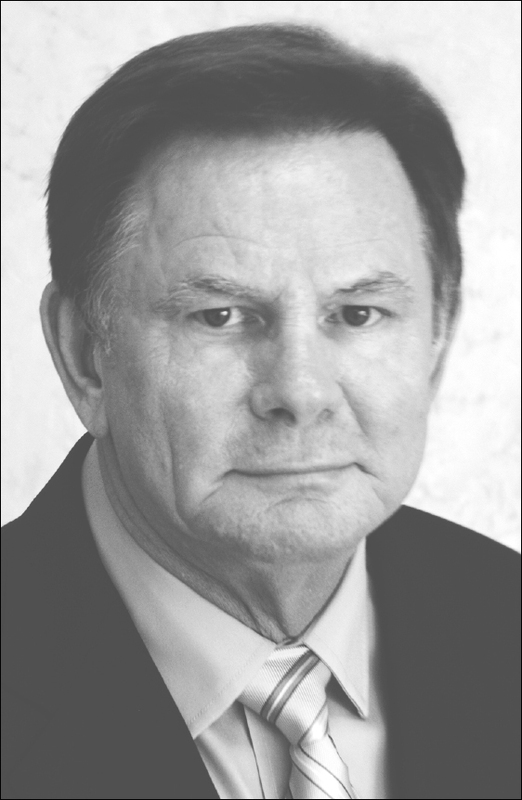 • Why the millennials are heavily socialist, and why they are wrong for blaming baby boomers for their economic problems. • The "climate change" hysteria is just another excuse for socialists and other statists to acquire more power over us. • And More... in the April-May 2019 EWR Subscribe Today! Practically all the crises happening in military events, the economy and investment markets now is a result of the federal government's empire, or the gradual collapse of it. 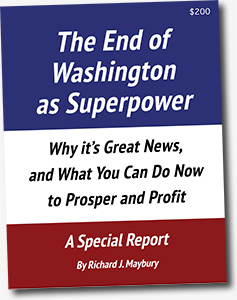 In this special report from Richard J. Maybury, discover the political and economic upset of our time. Understand the events, starting in the 1940s, that led to Washington's rise to global dominance, why this dominance is now in decline, and the many ways this is affecting you profoundly. Learn why the empire's demise is far from bad news. Instead, Mr Maybury views it as an exciting chance for America to make a fresh start toward a new age of freedom, security and abundance. You'll be amazed. Mr. Maybury also sees this historic upset as a spectacular opportunity for investors who understand what is happening. The eye opening 150 page report contains 34 carefully selected investment recommendations. Order today! A name for the bloodiest, most chaotic place on earth. Taking up more than half of the earth's landmass, and containing huge deposits of minerals including most of the oil, Chaostan can affect your life more than anything that happens in your own hometown. And few, if any, understand it. 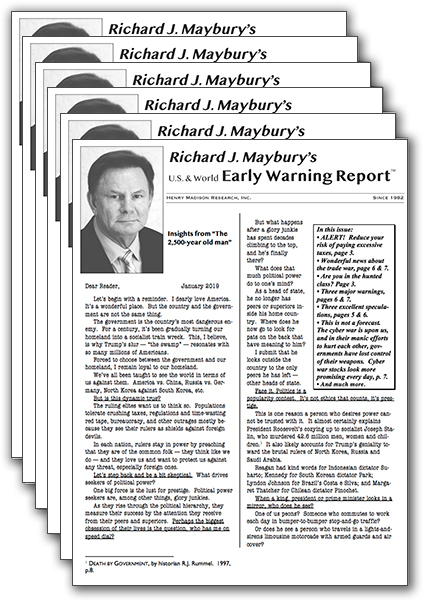 Since 1991, Richard Maybury's Early Warning Report (EWR) has been studying Chaostan, and its effects on you and your investments, with astounding success. What makes Early Warning Report (EWR) so unique? So interesting? DEPTH. EWR is a unique blend of topics that you've probably never encountered before. Namely geopolitics, finance, economics, and military affairs. We don't give you a list of "hot" stock picks, expect you to believe us, and send you on your way. Rather we start with understanding the two major trends affecting your investments: debasement of currencies and law, and threat of war in the South China Sea. The US dollar is the world's reserve currency, and thanks to the federal reserve its become a shell game. Nothing is more crucial to understand: the Federal Reserve dictates the health of the dollar, and the health of the dollar dictates your quality of life. You must know how to adapt. But an understanding of economics isn't enough, because at bottom what really drives the ups and downs in the financial world are actions of governments. They regulate all currencies. They create laws that control how the economy operates. They command the militaries that cause the conflicts that disrupt entire regions of the world. Governments are capable of causing more chaos in your life than any other type of organization on earth. And they do it— constantly. This is why EWR focuses on geopolitics (world politics). Most investment advisories focus on the particulars of a given investment. They are concerned with the internals. The technicals. Few know anything about the Big Picture - the global trends - that affect investments. The closest they get to it is to study economics. The Big Picture is Early Warning Report's specialty. 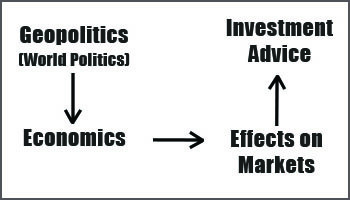 We see investment trends being primarily determined by economic trends, and economic trends determined by politics. To forecast what our investments will do we must forecast what governments will do. World politics changes flows of money, which alters economies, affecting markets, which produces investment profits. But, we don't mean what the mainstream press and its government cronies call politics. We mean the real thing: wars, revolutions, uprisings, and history. It repeats, although never exactly. Unfortunately, the typical investor is unaware of the impact governments have on markets. He flies politically blind. The world is like a chessboard, except unlike the conventional board, the number of players isn't 2, it's 206, meaning 206 governments. To win the game, you need to know how it is played, and nobody knows the strategies and tactics better than Early Warning Report.